The prospect of dramatic climate change has inspired a small industry of planners and architects to suggest ways to “future-proof” our built environment, girding against rising temperatures and severe weather events. In Brainiac, we’ve looked at some of these plans, including ideas for how to save East Boston from the sea and how to turn water into a positive feature of the New Orleans landscape. In that spirit, a chapter in a new book called “Imagining the Future City: London 2062” offers some useful tips for how architecture in chilly, dank London could be modified to ward off the worst effects of climate change. Environmental designer Sofie Pelsmakers anticipates that 50 years from now, two of the biggest environmental challenges for London will be reflecting heat out of the city, and improving the city’s ability to handle intense bursts of rain. To reflect heat out of London, tempering the “urban heat island” effect that makes cities hotter than their surroundings, Pelsmakers suggests replacing London’s asphalt and concrete with heat-reflecting grass, trees, and planted rooftops. As for how to protect buildings from flooding during periods of intense, climate change-induced rain, Pelsmakers’s ideas are slightly more whimsical: floating buildings, houses on stilts, and a “sacrificial basement” for collecting rainwater. Some of these ideas are already used in waterlogged tropical countries, where villagers live on floating or stilt structures; some US coastal cities also have stilt houses. It’s kind of an eye-opening way to think about climate change, that Londoners might need to borrow tactics from places that up until now they’d only visit on their most ambitious vacations. What do the sizes of a football field, a Ping-Pong table, and a soccer pitch have to do with each other? You might think nothing—that the playing areas are more or less arbitrary and owe to the particular circumstances in which each sport developed. 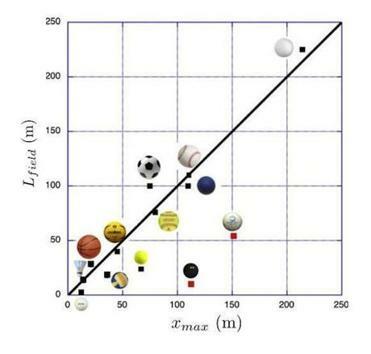 However, a team of French physicists has recently discovered an unexpected law running through the dimensions of courts and fields of very different sports. The researchers also looked at how long it takes a ball to travel over the length of a field, and found that this varies greatly. 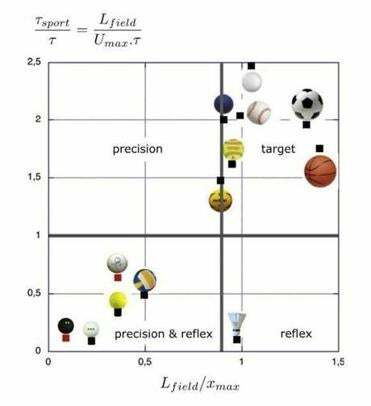 They suggest that sports can be sorted into two groups: “precision and reflex” sports (chart below), where the ball traverses the field very quickly (jai alai, volleyball, tennis) and “target” sports where it takes the ball a relatively long time to fly over the length of the field at its maximum speed (baseball, golf, soccer). The most popular spectator sports in the United States fall into the “target” category, which makes a certain sense: It’s always enjoyable to watch a sport that proceeds slowly enough for you to really watch the action unfold. Kevin Hartnett is a writer in South Carolina. He can be reached at kshartnett18@gmail.com.